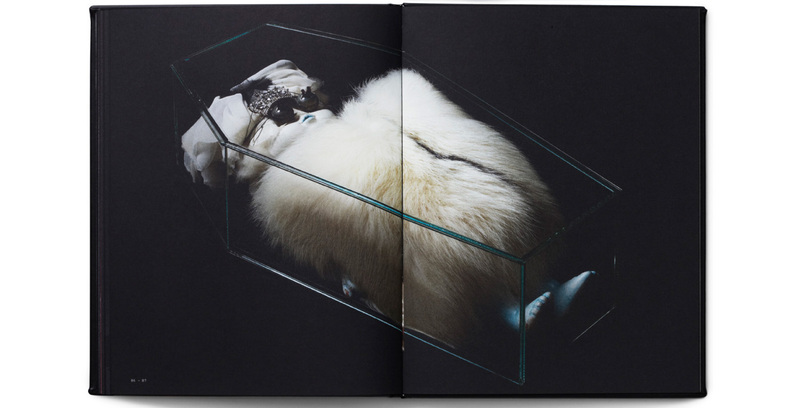 In connection with artist Nikoline Liv Andersen’s exhibition, ”Slowly Seeping Through My Hands”, at Horsens Art Museum, a publication had to be made. The publication had to work both with the exhibition but also afterward as an independent work that sets the stage for Nikoline Liv Andersen’s universe. Nikoline Liv Andersen’s pieces are uncompromising and challenging, and revolve around existentialism – why should we live, when we must die? The publication had to express the mood of the pieces, the sad and slightly bleak, without overshadowing them. The publication is bound in black leather and embossed with the title of the exhibition. Furthermore, the edges of the book have been painted black, and all together this gives an expression inspired by headstones and old bibles.